1. Please provide your login details by using this form – http://wedevs.com/provide-login-details/. I will have a look what is going wrong. 2. I think there is a problem with the seller payment confirmation. Paypal confirmation must needed to have a sub pack. We did not get any error like this before. 1) can there be: multiple shipping discount from single shop (i.e., ship 1 for $5, and add a 2nd product for only $2 ship, total $7 ship). 5) When I have my subscription set up as “recurring”… the subscription order NOT show up in the sellers order history (aka they paid, but have no package). If it set as non-recurring.. it works fine and the package is there. 6) A seller of mine has a 2 product subscription… she added 1 product fine, and added a 2nd product… the 2nd product she went into change category and now its “gone” and she is unable to add a 2nd product back it… says she needs a new subscription for more then 2 items. I have checked, and find no 2nd product for her.. so unsure how to fix and give her what she is subscribed for. 7) When vacation mode is on, my front page slider images go HUGE. Totally wonks out the featured slider… so I have to disable the vacation plugin, and the front featured products slider is back to normal. 1. This feature is not available right now. 2. You can add variation for a sing product. You can add attributes for a product. Please read this doc- http://docs.wedevs.com/add-drop-down-attributes/. 3. This feature is not available now. But it will available in our next update. I have notified to our developer about this. Hope they will think to implement this in our next release. 4. In our next release this social filed will be available. For 5 and 6- I have tested normal sub pack with two product but everything is fine here. I think there is something missing. If you are sure about the payment confirmation and it seems like not working then i have to discuss with our developer about this. 7. You can send your details to fix this seller vacation issue. However, this is a HUGE problem. So you are saying that the following cannot happen? In other words… if a buyer grabs 3 things from a single same shop.. and shipping is $5 per item… thats $15, and CANNOT be discounted to say $7 total shipping? This is not good, and will deter A LOT of sale, and sellers from signing up. Buyers will not want to pay huge shipping charges like this. This MUST be a fix in an update… I cannot be the only person thinking this…??? and 5) this is still not working. When I set to RECURRING it will not activate in the sellers dashboard. is there a way to hire a developer? This shipping issue… will be HUGE for me and may deflate the entire store and idea. I REALLY need a fix to this… thoughts? You can not add more than one vendors product in the cart. So someone cannot buy from multiple vendors? Im up to my neck in issues wit my dokan… and honestly, these are all things that should be TYPICALLY INCLUDED in any marketplace. Please help… I want this to work, but I just dont know where to turn or what to do as of right now. We have added some new feature in our shipping which will be available in our next release. We will release our new version within couple of days. So, i think you can wait for that. For the second issue- I think you have selected your payment system as Chained payment. If you have selected chained payment then you have to change the mood of seller. 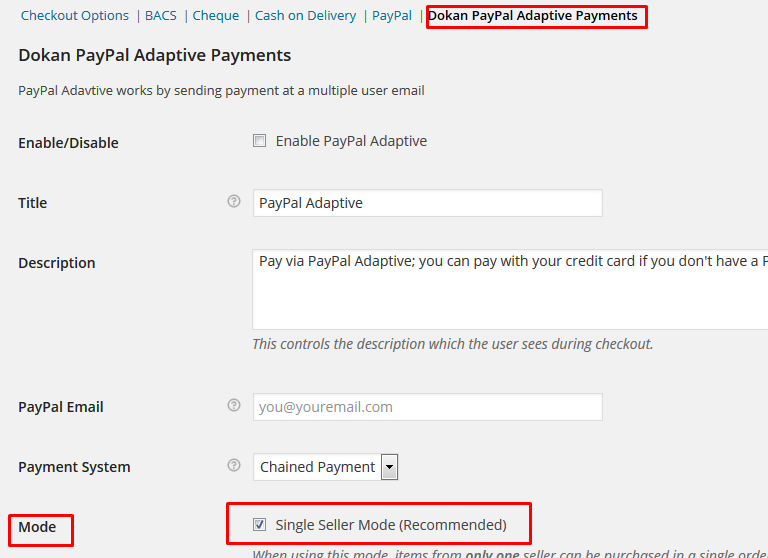 Please navigate to WooCommerce->settings->Checkout and select Dokan PayPal Adaptive Payments and disable the single seller mood. I cannot WAIT for the shipping update, my sellers will be pleased. As for Adaptive payments…. no, I have PARALLEL PAYMENTS marked, not chained. And really, a COUPLE DAYS? If so, this is wonderful… but I need to fill in my sellers honestly.. if it will be a couple days to get the shippig issues fixed (add in discounts for buying multiple from same shop), we will wait to launch. THANK YOU.. please let me know if it will honestly be a couple of days, or if we are thinking weeks…? We will release our next update within couple of days. We have new shipping feature in this which will be available in our next release. You can wait for that because there is lots of option in this new shipping feature. I hope it will full fill your needs. Automatic update notice will available in your dashboard when the update will available. We are working on the documentation of our new update. If you want then we can send you the latest version for beta testing. You can test it. Please let me know.